By 2022, Dachser wants to convert all its Road Logistics locations in Europe to this new technology. The switch will be made step by step; locations will not operate both technologies together. 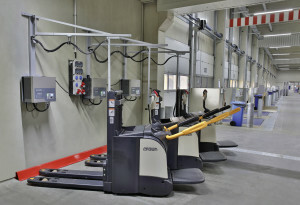 Lithium-ion technology has already been successfully introduced in the Radeburg and Erlensee (Food Logistics) branches, and will now be followed by construction and expansion of facilities, for example in Freiburg and Munich, the plans for which will include the necessary electrical infrastructure from the outset. Thanks to some 29,100 employees at 396 locations all over the globe, Dachser generated revenue of EUR 6.12 billion in 2017. That same year, the logistics provider handled a total of 81.7 million shipments weighing 39.8 million metric tons. Country organizations represent Dachser in 44 countries.